Problems with eating and swallowing are recognised as features of advancing dementia and may be a sign that the person is entering the terminal phase of illness. Such problems cause considerable concern and anxiety among family members, carers and health professionals. They also raise moral and ethical issues about artificial nutrition and the emotional and practical aspects of end of life care. 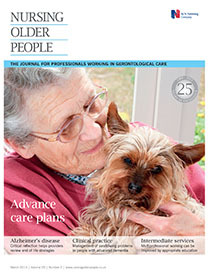 This article discusses the eating and swallowing difficulties that may present in people with advanced dementia and multidisciplinary best practice in their management. It also explores how families, carers and care home staff can be supported in making best interest decisions about artificial nutrition and end of life care for people with advanced dementia.